Poet is designed so you can create the perfect Scholar course and feel confident doing it. This page is no different: The Poet Access Guide provides a comprehensive overview of how to create a course, how to use the many tools Poet offers, and how to use those tools to your full advantage. New to Poet? The materials below will walk you through critical tasks step-by-step, but if you first need basic info on what Poet is and why it’s so powerful, check out the Poet Editing and/or the Poet Authoring product pages. 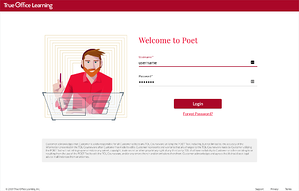 On the Welcome to Poet page at poet.trueoffice.com, simply enter your username and your password to log in. If you need to reset your password, be sure to have access to the email address associated with your account. Poet relies on modern browser features to work; therefore older browsers (Internet Explorer 10 and below) are not supported. Also, please note that your credentials for Poet are the same as your credentials for I.Q. (if you are also an I.Q. customer). 4. Approve Ensure you and your team are certain that your Scholar course is locked and ready. Remember to regularly click the “Save” button in the Header (at the top of the page) throughout the editing process. We recommend saving before moving on to another page or making your next set of edits. True Office Learning recommends that only one person make changes to a project at a time. This will ensure that all of the desired edits are saved properly – multiple users editing the same project can cause problems like overwritten data or lost work. We also recommend exporting your script and assets at key milestones in your build/review process in order to save specific versions of your course. In the event that you need to “revert” back to a previous/original version, each script and ZIP file essentially acts as a backup. You can work from these exported files using the Import feature. Select the project you’d like to edit by clicking on its course name on the Course List screen. 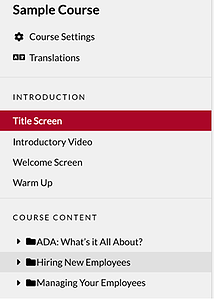 On the following screen (referred to here as “the Editor”), you’ll see all of the content and configurations for the Scholar course you selected. Authoring users can also create courses from this page using the “+ New Course” button. The left-facing arrow button at the top left of the header will always navigate you back one step: when viewing a course in the Editor, you'll return to the Course List screen. At the top of the page, you'll always see this red bar. When in the Editor, it holds the buttons for important interactions in Poet. To learn about each action, see the Key Features section below. This area shows an outline of your entire course. Use it to navigate from one page in the Editor to another. The Sidebar is organized according to the learner experience: introductory pages and features are at the top, then the core content and interactions, then concluding pages at the bottom. Click any page name to view and edit it in the main right panel. Please note that Category folders are collapsible/expandable for easier viewing. Categories are denoted with a folder icon, Topics with a book icon, Activities with a lightning bolt icon, and Slides with a bullet list icon. This large red button will always be at the bottom right of the Course Content Sidebar. Click it to add a new page, which will be grouped under the current active page. The pop-up window that appears will automatically show which page types are available for the current location of the Content Map. Click the “Save” button often! This will ensure your changes aren’t lost. Full Backup: Creates an export of everything in your current course, including the Script doc, all course assets, and (if included in your course) the Translations file. Rename and save the ZIP file to the desired location on your desktop or shared drive. Assets: Saves copies of your media assets as a ZIP file. This contains the images, videos, and audio files needed for your course. Script: Save written content as a Word doc. Any file(s) will automatically be saved on your computer (in the Downloads folder, or per your browser’s download settings). Any course that has all required content can be previewed at any time. Previews are a fully playable build of your course. A small window will pop up once processing is complete; click the “Preview Course” button to open your course in a new browser window/tab. Click “Get shareable link” to generate a hyperlink that you can send to other stakeholders. Please note that for security, these links expire after one week and can be manually de-activated at any time. Shared links will always show the most recent Preview build, so any updates you make will be visible when others use the link. Once a Preview build is complete, it is saved in Poet until a new Preview build is created. To reopen an existing build, click the ‘Existing’ option in the “Preview” button dropdown. Click the round button in the top left of any image container (denoted by 3 vertical dots) to replace an image or crop it. Text fields for long-form content (Course Material content, Scenario text content, Activity feedback text, and Slide content) have full HTML styling available. When available, the formatting options will appear as a row of buttons attached to the top of the field. Audio and video files can be added, replaced, or removed by clicking the “Change Video File” link located at the top right of the video preview. Videos can be added by uploading an MP4 file or by entering a valid URL. Please note that Poet does not accept videos with a file size over 25mb. We recommend a video of 15mb or less to help ensure a reasonably size course package and a smooth course experience for learners. Please note that only Poet Authoring users can create a new course. If you are a Poet Editing user, skip to next step in the workflow, the Editing Phase. On the Course List page, click the “+ New Course” button at the top of the page to create a new course. 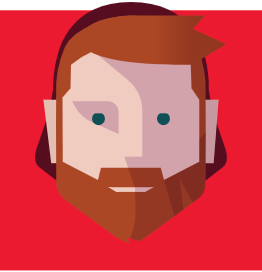 Blank Course: Starting from scratch, Poet will walk you through creating a Content Map (outline) of your course. After that, you’ll develop your content, Course Material, and activities—all organized by Category. From a Template: Start quickly by choosing a template that corresponds to the type and the size of course you’d like to create. Don’t worry, you can add/delete and move content as needed to make this a better fit for your needs—these templates will just give you somewhere to start. Want your course to change difficulty as learners move through it? Choose an adaptive template. More comfortable with a fixed-order course, or one where everyone sees the same material, in the same order? We’ve got a template for that too. If you have ~12 (or fewer) learning objectives you’d like to test on, start from the small course templates. Large templates are set up ton include as many as 20 learning objectives. Upload a Script: Already have a True Office Learning script and assets? Start here. Once the course is created, make any edits you wish. Duplicate an Existing Course: Any course in your Course List page can be duplicated using this option. Select the name of the course you’d like to duplicate, then give it a new title. Once the course is created, make any edits you wish. Click “Course Settings” (look for the gear icon) on the top left of the Content Map Sidebar. This will open the Course Settings in the main Editor window. In the Content Map Sidebar, click on “Title Screen” (in the “Introduction” section) to open Title Screen in the Editor. Click on the “Company Logo” area to edit or replace the image. Please note that only JPG or PNG files are accepted. In the Content Map sidebar, click on a Category name to access the Course Material content. For most organizations, this area will contain Policy text or any materials that outline the expectations for your learners to understand the course topics and message. Note that “Require Policy Acknowledgement” is turned on by default in Scholar courses. This requires that learners check a box to acknowledge that they have read each Category’s Course Material. This is separate from Policy Acknowledgment slides, which you can add to your course. Before doing this, consider where you would like your policies to appear in the course. We recommend adding the Policy Acknowledgment Slide in the Conclusion section (set the location to “After All Categories” in step 4 below), or to the end of a particular category’s Course Material if it relates only to a specific policy (set the location to “After Course Material” in the appropriate category). In the pop-up, choose “Slide”, then select “Policy Acknowledgment” and click “Add Page.” You'll see the page added in the Course Content sidebar, nested under the location you selected (in step 1, above). In the main Editor window, choose where you’d like the Policy Acknowledgement page to appear in the “Location” dropdown. Then add text to the “Title,” “Body Text,” and “Policy Button Name” fields. Add your policy URL (learners will see a link) or upload your policy PDF (learners will view the PDF file). Click “Course Settings” (look for the gear icon) the top left of theContent Map Sidebar. This will open the Course Settings in the main Editor window. Under the “Miscellaneous Options” section, you’ll see a toggle for “Open external links in new window.” This can be turned on for organizations with restrictive firewalls. Turning this off will open links in a frame within the course, instead of a new browser tab or window. Simply click on any input field you see to make edits to the text it contains. Images in the course can be added, swapped, and cropped using our easy Image Editor. We strongly recommend using images that your company owns or that have been purchased from a stock photo website. Talk to your design or legal team if you have questions about image copyrights. Most pages in the Course Content section of the Content Map Sidebar can be re-ordered by clicking and dragging. Keep in mind that Activities and Topics are randomized in Scholar (by default), so re-organizing them in Poet may not affect the order they’re shown to your learners. Please note that Activities must be grouped under a Topic, Topics must be grouped under a Category, and Slides can live in many places. Confused? See the Terminology section below. Click on “Title Screen” in the Content Map Sidebar to adjust the first impression learners get – this screen displays the course title, a background image, and a preset layout, as well as your organization’s logo. It’s a good idea to “brand” your course a little here, so learners understand that this is a trusted, official source of knowledge from your organization. The live preview will show you the effects of changing your logo or background image and changing the layout. Scholar courses begin with a brief video that primes learners on the topic at hand. Many organizations prefer to replace this video with a message from an executive or a custom training video. 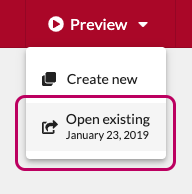 Click on “Introductory Video” in the Content Map Sidebar to open Introductory Video in the main Editor window. This page does not provide functionality to make edits to video files. Please note that editing subtitle text in an existing video will not have any effect on the video graphics or narrator’s audio; it will only make subtitle text inaccurate! Contact service@trueoffice.com if you want to request edits to the existing video. Please use caution when deleting content, especially at the Category or Topic level – deletions can’t be undone. To rectify an unwanted deletion, you will need to recreate the deleted content or import an old script, which might result in inaccuracy or loss of previous edits. When editing the Title Page, the “Layout” will show you what your background image and chosen layout will look like in the course. Under Course Settings, changing the Color Theme will generate 6 preview images of important screens in a Scholar course, so you can see what the Theme really looks like. Videos in the Introductory Video page or in a Video Slide can be played right in the Editor. Click the “Preview” button in the Header to run through a live build of your course, which will include any saved edits. By default, preview builds have analytics/data capture turned off and debug mode turned on. This means that correct answers will all be marked with a ‘+’. Please note that the URL of this preview is not shareable (Poet access is required to view). Use the “Download” button in order to get the files you’ll need for other members of your team to easily review and give feedback on your course. Other stakeholders on your project can view your latest version by using a Shared Link. For more on this feature, check out step 3 of the Preview feature (in the Key Features section) above. Translations are inherently complex, which is why we strongly recommend getting full and final approval of the “master” English-language version of your course before beginning any translation process. Changes to one language will result in inaccuracies in all other languages. Click Translations in the Content Map Sidebar to select one of two options here: open the accordion for either option to learn more. This process includes a checklist of all possible languages, which can be toggled on or off as needed. The checklist affects which languages will be included in your translations Excel file. Check the “My course content is finalized…” box and click “Request Translations” to have your course sent to our team at True Office Learning to be translated in your chosen languages. This will incur charges from TOL, and you will not be able to make edits to your course once your content has been submitted (without requiring new translations and further charges). Please note that once you choose to request translations, you will no longer have the option to translate with your own vendor. This process assumes you have access to a reliable translation vendor – we strongly urge you not to rely on your own team members, or especially online/automated translations, to translate your course. The accuracy of the content you add in this process is your responsibility and/or that of your chosen vendor. Please note that once you choose to initiate this process, you will no longer have the option to translate with True Office Learning. *To make changes/edits to a published course, you’ll need to contact your TOL Relationship Manager. To complete your Poet project, click the “Publish” button in the header. In the window that pops up, confirm (once and for all!) that your course is complete by manually typing the prompt into the text field. Once this is correctly entered, you will able to click the “Publish” button. Your final course package will then be built, which may take a few minutes. In this build, Debug mode will be disabled and analytics will be enabled. In the next pop-up, choose “Download SCORM package” to automatically download the course package to your computer (in the Downloads folder, or per your browser’s download settings). This package will be ready to launch on your LMS. Congratulations! Close the next pop-up and contact your TOL Relationship Manager to begin the upload and enrollment process for your course to launch on Learn I.O., TOL’s modern, hassle-free LMS. Congratulations! Content Map: A full outline/structure of your Scholar course. If you’ve worked with true Office Learning, you’ve seen this map inform your full course script; here in Poet, it’s used to structure your course in the Content Map Sidebar. Key Concepts: What you want your learners to learn from the course. Category: The highest-level grouping of content in a Scholar course. Think of these as ‘chapters’ in the book that is your course. Each Category has a section of Course Material attached to it and must contain at least one Topic. Course Material: The information you want your learners to read about and understand within each category. For most organizations, this includes the actual policy text. Topic: The guideposts for what your learners take away from your course, Topics ensure the needed concepts in your content are tested Each Topic must contain at least one Activity. Activity: This is the core of Scholar interactions: a clickable interaction that allows learners to apply what they’ve learned. Activities contain a Scenario by default. There are several types of Activity/interaction types that you can configure: Card Flip, Hotspots, Binary Swipe, Sliding Cards, Matching, and Fill In the Blank. Scenario: The setting or context for an activity that practices a learning objective through a real-life application. Scenarios display before an Activity by default. Difficulty Level: Scholar courses use an adaptive framework to tailor each learning experience based on what learner knows–this is accomplished by changing difficulty between two levels. ‘Normal’ content is achievable for the average learner, and ‘Difficult’ content is meant to challenge expert learners. Choose ‘Both’ if you’d rather not segment your content in this way. Slide: A type of page you can add to your course that presents information only (is not interactive). There are several varieties of slide, depending on whether you want to teach via text, image, video, audio, or a combination of these media.